At this point I wouldn’t consider myself a great connoisseur or collector of first editions. Yet recent forays into old book fairs, library castoff sales, and regular jaunts to Half Price Books often have come a cropper with unexpected gems. And affordable ones, too. Price points of $1 – $2 have not been uncommon. To wit, today’s example. Back in February some students at the University of Louisville had a sale of donated books, CDs and videos at which I was happy to procure some Ralph Vaughan-Williams symphonies on Chandos and Naxos CDs for $1 or less, some formerly very expensive ($40 each) Japanese film classics on high quality VHS tapes that were issued in the 1980s as part of the so-called Sony Japan Film Collection (50 cents each), and lots of historical books and some real oddball items, such as an early 1950s pulp softcover of Is Another World Watching? The Riddle of the Flying Saucers by Gerald Heard plus an early to mid-1940s postcard shaped paper book call A History of the War – In Maps – In Pictographs – In Words, put out by Penguin, and interesting because at the time of publication the war (WWII) was still not over. One book I eyeballed activated my hunch meter, a first edition of The Memoirs of Marshall Mannerheim (Dutton, 1954), about a great Finnish general who saved Finland during the Winter War against the Soviets in 1939. 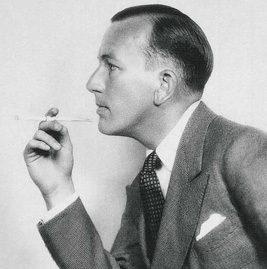 Another item of interest was Future Indefinite, a first edition of an autobiographical tome by the gay dandy of British theater, Noel Coward. 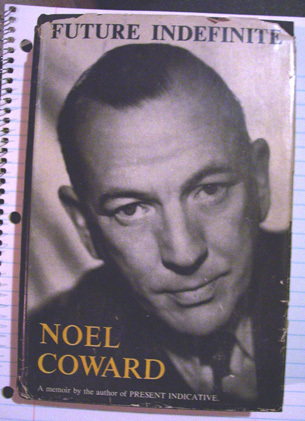 The latter item, I thought, would be a nice supplement to a book I recently bought (but have not read): Philip Hoare’s 1995 Noel Coward: A Biography, which is, just by a glance and by the reviews, easily the best biography of Coward available. I picked up the Coward book unhesitatingly, but balked at first at the Mannerheim one. That is, until I went back to my computer and looked it up on Amazon and eBay and found that copies are long, long out of print and routinely priced at more than $100. I raced back to the sale and snatched it for a dollar. 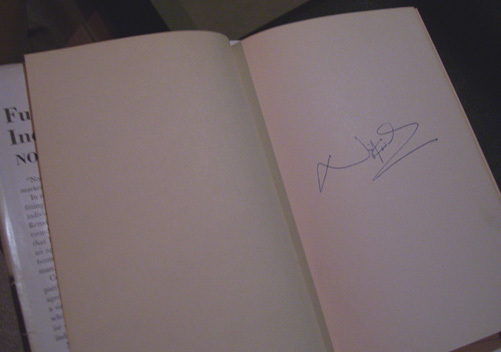 Feeling that I had gotten the one real gem of the day, I sorted through my booty and casually flipped the pages of the Coward, whereupon the inside front cover page opened upon a signature. I beheld it and thought it must be the previous owner’s mark. 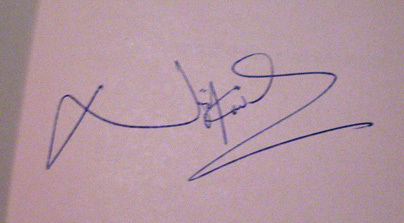 Until I saw a big ‘N’ and a flourish of a signature that suggested “Noel Coward.” I was excited, but skeptical. I did a little research on the internet and found examples of Coward’s signature that left no doubt. This was a first edition with a genuine Noel Coward signature. He was sort of the twentieth century’s Oscar Wilde, from the wit to the gayness. I’ll be holding on to this signed copy of Future Indefinite for awhile, just for the satisfaction of possession and then probably list it on Amazon or Half.com or eBay for $100 or so. (I’ll entertain any fair offer for anyone willing to pay with money order or Paypal.) As of this posting a signed first edition is being offered on eBay for $285. Who says a dollar doesn’t buy much anymore? You are currently browsing the archives for the first edition category.